Popcorn 55 Bath Towel. Sea Blue  - $17.00 : Yarn Tree, Your wholesale source for cross stitch supplies. Item 4134. 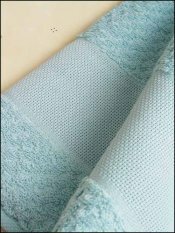 Sea Blue Popcorn 55" Bath Towel. Attractive nubby popcorn texture makes this towel eye-catching. 100% cotton loop hemmed terry bath towel weighs 13.5 ounces with a 3 1/8” 14ct border for stitching. Measures 27½”x55”. Combine with the 31" hand towel and the 18" fingertip towel for a great gift idea!